Panasonic Automotive & Industrial Systems Europe announces the extension of its HL Series Electric Double Layer Capacitors (ELDCs), which offer low resistance combined with guaranteed long life over a wide temperature range, from -40 to +85°C. Panasonic HL Series Gold Capacitors are wound radial lead type devices, which achieve far better capacitance compared to aluminium electrolytic capacitors (up to 1,000 times greater) and superior backup performance. Additional benefits of rapid charge and discharge cycles, (over 500,000 times) and exceptional ageing characteristics make Panasonic HL Series ELDC capacitors ideal for applications such as backup power supplies for servers and storage devices, solar-powered products, smart grid solutions, and driver-assist for motors and actuators in a variety of markets. The extension of the HL Series adds nominal capacitance values of 2.5F, 4.5F and 7.5F to the existing 50F and 100F parts, all rated at 2.7VDC. 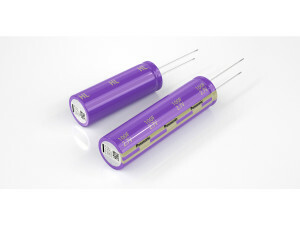 These ELDCs are guaranteed to maintain their capacitance and internal resistance without drifting at low temperatures, as opposed to other products available from competitors where the capacitance and internal resistance values may change by ± 30% and up to 7 times respectively from initial measured values. New, smaller size HL Series devices are guaranteed for a life of 2,000 hours at +70°C but can achieve 1,000 hours at 85°C with voltage derating. For power backup applications where ageing characteristics cause a rise in internal resistance and rapid decline in capacitance, EDLC capacitors are especially beneficial. Due to the unique electrolyte used in the Panasonic parts, such ageing effects are mitigated, in effect leading to part count reduction.